Scarlet | Meet The Ambassador | RAPTOR Inc.
Scarlet:Red-Tailed Hawks can frequently be spotted on top of utility poles along North American highways or soaring over forests and fields. They thrive in a wide range of habitats, including cities, and freely nest in close proximity to human activity. 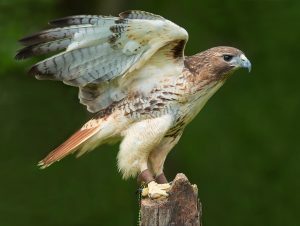 Although most raptors are not dimorphic, Red-tailed Hawks can frequently be determined by their size. In fact, unlike most mammals, the females are typically 25% larger than the males! Scarlet is 19″ tall, weighs 3 lbs. and has a 54″ wingspan. She came to RAPTOR Inc. as a juvenile in 2003 from East Fork State Park with a fractured left wing.